The city of Dallas has a rich history rooted in ranching, farming, and oil production, growing rapidly as a trade center after the introduction of the railroad in 1873. 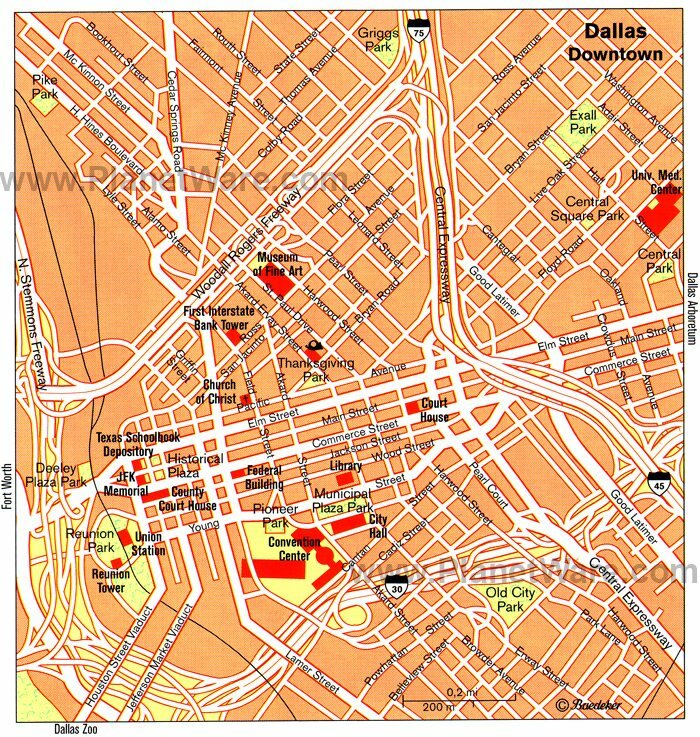 After WWII, the city became home to numerous insurance corporations and banks, making it an important business and financial center - perfect fodder for that most famous of soap operas about power, money, and intrigue: Dallas. Tourists will also enjoy the wide variety of architecture, most notably modern and postmodern structures like the Perot Museum of Nature and Science, the Gothic revival Kirby Building, and the Victorian and Neoclassical homes on Swiss Avenue. The city is home to several excellent museums, including the Dallas Museum of Art and the Sixth Floor Museum at Dealey Plaza, as well as top-rated attractions like the Dallas World Aquarium and Reunion Tower. Dallas also offers plenty of things to do outdoors, including a visit to the lovely Dallas Arboretum and Botanical Garden and the impressive sculptures in Pioneer Plaza. Forever etched in infamy, the former Texas School Book Depository at the intersection of Houston and Elm Streets in Dallas is now home to a museum dedicated to remembering one of the nation's most tragic and defining moments. Visitors to the museum are first introduced to the historical context with multimedia exhibits that describe the political climate of the early 1960s and then go on to highlight President Kennedy's trip to Texas in November of 1963 and the last days of his life. Just past here, you will see the sniper's perch in the corner window from which Oswald took the deadly shots, recreated to match the original photos from the crime scene. The remaining exhibits walk you through the tense hours following the shooting, recollections of the state of shock that enveloped the nation and the world, the investigations that followed, and JFK's legacy. Exhibits also include historical artifacts, like a replica of the Mannlicher-Carcano rifle found at the crime scene, the scale model of Dealey Plaza used by FBI agents during the investigation, forensic evidence, and items such as Lee Harvey Oswald's wedding ring and Jack Ruby's hat. 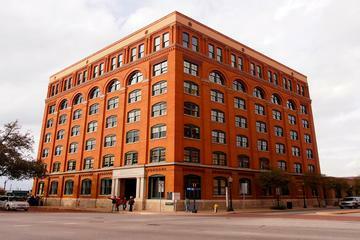 To get more from your visit, the Sixth Floor Museum at Dealey Plaza tour includes admission to the museum and a guided audio tour that expands upon the information in the exhibits. The tour includes narration by Pierce Allman, as well as audio clips of actual radio broadcasts, eyewitness reports, and police statements from the event and the days following the tragedy. Just a few blocks away across from the city courthouse, the John Fitzgerald Kennedy Memorial is an imposing yet understated monument to the president. Designed by architect Philip Johnson, its construction was completed in 1970 after years of controversy. Just minutes from downtown Dallas, the Dallas Arboretum and Botanical Garden sits on 66 acres along the southeast shore of White Rock Lake. The property's fourteen world-famous displays showcase seasonal flowers, ornamental shrubs, trees, and plant collections. The gardens also host seasonal outdoor festivals, concerts, art shows, and educational programs, and guided tours of the property are available. Although conceived in the early 1930s, this splendid tourist attraction didn't become a reality until 1984, when the park was laid out on the grounds of a mansion built in 1939. Adding to the fun are the exquisite sculptures and fountains in areas with names like Toad's Corner, Texas Town, and Pecan Grove. Be sure to do a little exploring around White Rock Lake Park, too. Surrounded by 10 miles of hiking and biking trails, it's known for its excellent bird and wildlife spotting, as well as fishing and sailing. Housed in a massive architectural masterpiece designed by Thom Mayne, the Perot Museum of Nature and Science is a top Dallas attraction for families and curious tourists. The building itself was designed with sustainability as a foremost goal, including summer water conservation with the use of recaptured condensation from air conditioners and drip irrigation, the use of recycled and locally sourced building materials, and solar-powered water heaters. The museum is divided into thematic areas with interactive educational stations, games, and high-tech displays. These themes include engineering and innovation, energy, evolution, earth sciences, and more. It also features a 3D theater, the Moody Family Children's Museum and playground, and a 54-foot escalator that overlooks the property from within a glass enclosure. The Dallas Museum of Art has been a long-standing institution in the city since it opened in 1903. One of the ten largest museums in the United States, it has a collection of more than 24,000 works from the Americas and around the globe, including everything from ancient artifacts to contemporary art. Highlights from the collection include Classical art and artifacts from ancient Egypt, Greece, and Rome, paintings by Claude Monet in the European art gallery, and several contemporary pieces by Jackson Pollock. In addition to the permanent collections, temporary exhibits highlight the work of prominent artists, explore thematic topics, and display historic collections. Another art exhibit worth catching is the Wendy and Emery Reves Collection, housed in a re-creation of the Reves Villa and including Impressionist paintings, antique carpets, Chinese porcelain, and early Renaissance and 17th-century European furniture. Conveniently located within walking distance of the city's historic downtown core, Dallas World Aquarium is a fun and educational excursion for young and old alike. Housed in some 87,000 gallons of saltwater are a vast array of sea life including bonnethead sharks, stingrays, jellyfish, sea turtles, giant groupers, and rare leafy seadragons, all living in natural reef settings. A fun highlight is the Orinoco Rainforest exhibit, complete with numerous free-flying birds, such as toucans, along with tree sloths and aquatic species such as Orinoco crocodiles and poison dart frogs. Hot Tip: Check the feeding schedule before arrival for a chance to see the animals at their most animated, as well as for details of upcoming talks and lectures. Pioneer Park, maintained by the adjacent Dallas Convention Center, is designed to resemble a section of the Shawnee Trail, a major Texas cattle drive route in the 19th century. This large green space in Dallas's central business district has a stream that falls over limestone cliffs, but its most remarkable feature is the 49 larger-than-life bronze sculptures of Texas Longhorn cattle that are being herded through the park and across the creek by three mounted cowboys. Designed by artist Robert Summers, the park is landscaped to reproduce the scene of the iconic industry that defined early Texas. The Dallas Zoo is a 106-acre park housing more than 2,000 exotic animals from 406 species in a variety of different habitats. Always popular with families, this fun attraction - just three miles away from the city center - was established in 1888, making it one of the oldest zoos in the United States. Focusing on two major regions - ZooNorth and the Wilds of Africa - the zoo includes highlights such as Giants of the Savanna, the Otter Outpost, the excellent Wildlife Amphitheater with its displays of birds in flight, and the Endangered Tiger Habitat with its forest-like setting. The newly refurbished Wilds of Africa Adventure Safari monorail takes park visitors on a journey through the Great Rift Valley and habitats of African countries like Ethiopia, Kenya, and Tanzania. Another attraction kids will love is the Zero Gravity Thrill Amusement Park, a fun theme park with enough bungee jumps and free-falling rides to keep them amused for hours. While not the tallest building in Dallas, the Reunion Tower is undoubtedly the most distinguished and most recognizable. Completed in 1978 and appearing as a geodesic ball perched atop five cylindrical concrete poles, its 560-foot length is spectacularly lit up at night, emphasizing its unique outline. After renovations in 2011, the Reunion Tower now boasts a revolving restaurant with 360-degree views over Dallas, and the GeO-Deck observation level, home to an informative interactive display providing details about the building and notable landmarks. Opened in 2003, the Nasher Sculpture Center has a collection of modern and contemporary sculpture and contains exhibits exploring the history of the art of sculpture. Located in the heart of the Dallas Arts District, large outdoor sculptures are on display throughout the tree-lined grounds. Highlights include pieces by Edgar Degas, Henri Matisse, Pablo Picasso, Max Ernst, and Andy Warhol. The museum and sculpture park also regularly host events, including lectures and concerts. Another gallery worth visiting is the nearby Trammell and Margaret Crow Collection of Asian Art, a museum dedicated to the arts and cultures of China, Japan, India, and Southeast Asia. The Frontiers of Flight Museum is home to more than 30 aircraft and has extensive exhibits that display the journey from the roots of aviation from Leonardo da Vinci through modern space exploration. The museum collection includes a full-size model of the Wright Flyer; artifacts from the Hindenburg; WWI and WWII aircraft and artifacts, including a fully restored Stearman PT-17 Kaydet Biplane; and the Apollo VII spacecraft. On display at Love Field, the Braniff Gallery and Virgin America exhibit highlight the history of commercial aviation. Another excellent aviation museum is the Cavanaugh Flight Museum in Addison, just north of Dallas. Located in a massive hangar, the museum displays a large collection of aircraft dating back to WWI, as well as related artifacts and artwork. Founded in 1974, the African American Museum has a variety of displays of African American artistic, cultural, and historical materials. Full of references to traditional African motifs and cultural icons, the museum's collection includes numerous pieces of artwork, along with a library and historical archive. Educational and entertainment programs are also hosted in the on-site theater. Another important attraction is the Dallas Holocaust Museum and Center for Education and Tolerance with its moving displays, such as an actual boxcar used to transport Jews during WWII, and memorials, including the names of family members lost to survivors who had settled in Dallas. If you are looking for things to do, the Bishop Arts District in Dallas's North Oak Cliff neighborhood has nearly endless possibilities for shopping, dining, and entertainment. It features more than sixty independently owned and operated businesses. Here, you will find chic boutiques, art galleries, restaurants, and cozy coffee shops in an inviting small-town atmosphere. Among the unique purveyors are specialty shops that cater to male clientele, like the quirky M'antiques; several women's vintage clothing boutiques; and a myriad of shops that carry items made by local artists and designers. A place with a strong sense of community, the neighborhood often hosts family-friendly street festivals and public entertainment. If you were around in the 1980s and owned a television set, read newspapers, or worked in an office, there's little chance you'd have escaped the wave of interest that swept the world when Dallas hit the small screen. Now that you know who shot JR, you can visit the location where the series was set: Southfork Ranch. About 25 miles north of Dallas, the ranch welcomes visitors for guided tours of the mansion. Afterwards, you can enjoy an authentic Texan chuckwagon dinner on the grounds. Texas was famous for its big railway engines, and the Museum of the American Railroad is the place to see them. Home to one of the oldest (and largest) collections of passenger cars, rolling stock, and railway-related artifacts in the country, the museum features the largest steam, diesel, and electric locomotives ever used, and all just 29 miles north of Dallas in the town of Frisco. Another fun excursion is Wichita Falls. Although some two hours drive northwest of Dallas, it's worth it for those who enjoy a little culture as the town boasts a symphony orchestra, a ballet company, many professional theatrical performances, numerous fine museums, art galleries, and festivals. For history buffs, historic Kell House Museum alone is worth the drive. Built in 1909 for Frank Kell and his family, the museum is a testament to the history of Wichita Falls and showcases original pieces from the Kell family as visitors step back in time through the beautiful red oak and beveled glass door into a receiving room decorated in Victorian style. If from Wichita Falls you continue your journey northwards, be sure to add Lake Meredith to your list of stops along the way. Here, you'll find the Lake Meredith Aquatic and Wildlife Museum with its interesting displays relating to the Texas Panhandle and its flora and fauna. Luxury Hotels: In a great location, close to the Arts District and within walking distance of several museums and other attractions, is the Omni Dallas Hotel, with a terrace pool overlooking downtown. To experience the elegance and grandeur of the early 20th century, the historic Adolphus Hotel, first opened in 1912, is the perfect place to stay. In the Uptown district, the Hotel ZaZa is a charming boutique hotel with beautifully decorated themed rooms and a quaint pool area set in lush surroundings. Mid-Range Hotels: The Homewood Suites by Hilton in downtown is an all-suites hotel in a good location near the Arts District, Convention Center, and numerous restaurants and shops. In the former Magnolia Petroleum Company Building, built in 1922, the historic Magnolia Hotel offers modern extended-stay suites and guestrooms and is conveniently located downtown. Another good mid-range option is the Hotel Indigo, in a National Historic Landmark building, which was formerly the Dallas Opera House. Budget Hotels: Budget options in downtown Dallas are limited, but good deals are available just outside the city center. 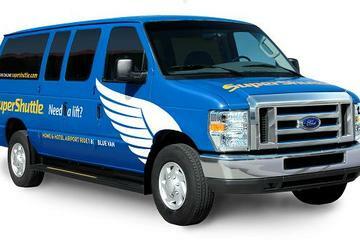 In Uptown is the reasonably priced La Quinta Inn Dallas. A fair distance outside the city center but offering good value are the Days Inn Market Center and the Candlewood Suites.